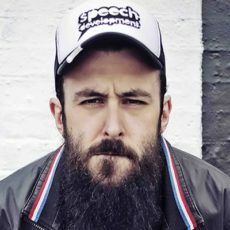 Scroobius Pip has broken ranks from his beat-making sparring partner Dan Le Sac to release his solo album, ‘Distraction Pieces’ via Strange Famous Records in US/Canada! “Introdiction” is produced by Renholder, aka Danny Lohner, (Nine Inch Nails / A Perfect Circle). The album features collaborations with fellow SFR crew Sage Francis and B. Dolan, as well as P.O.S. of Doomtree, plus extra production from Richard Russell of XL Recordings, Radio 1’s Zane Lowe, Aupheus, Worgie, and Steve Mason. Yila served as the project’s executive producer.